Universal-Fit Forklift Cement Buckets are intended for “extendable-reach” forklifts and allow placement of material way past the reach of a loader. Avnix’s heavy duty design will ensure forklift buckets will take a lot of punishment year after year, maintenance free. Our forklift buckets have a hard-edged beveled cutting blade on sides and leading edge supply strength, firmness, and reduce wear tear. Heavy Duty scuff bars strengthen the bucket bottom and shield it from rough wear. Standard buckets are designed for forks that are 48″ long and up to 6″ wide. Slip on the forks forklift buckets are about 50% deeper making it easier to carry irregular shaped loads such as broken-up concrete, debris, tear off, roofing material, dirt, soil and other trash. 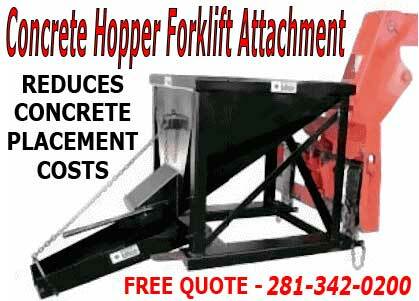 Heavy Duty Concrete Buckets Forklift Attachment. A Forklift hopper or bucket attachment slips onto the front of a forklift or a skid-steer, turning your forklift into a front end loader. Depending on what job it is intended for and also on heavy equipment brand and model, it features either a universal fit or quick tach attachment. With the right set of bucket attachments, one or two fork trucks or skid steers is all you need to run an operation where multiple, specialized tasks must be performed safely and quickly. Just a few of these applications follow. Forklift Bucket Attachments Eliminate The Need For Front End Loaders. Our smaller, sleek design allows concrete buckets to access hard-to-reach places where front end loaders cannot go. Quick tach bucket attachments are ideal for loading sand and gravel, and they can also be used at the end of the day for construction site cleanup. In northern climates, they are regularly used to move snow. 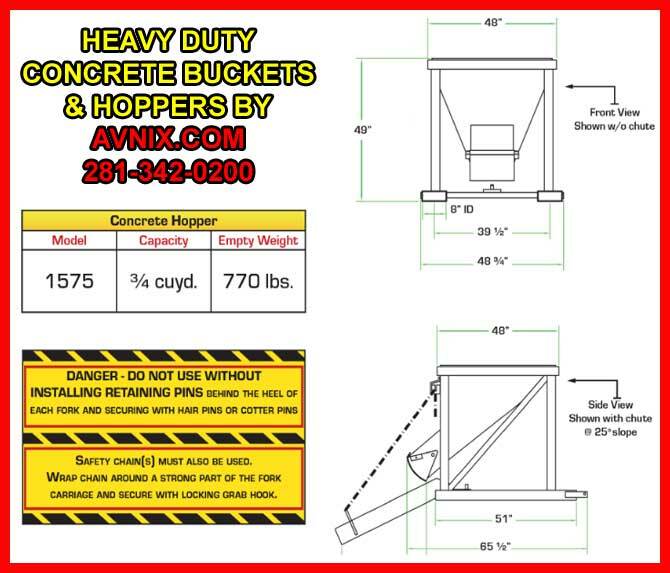 Universal, “slip over the forks” buckets are excellent loaders for elevating roof gravel to the tops of buildings. They can also be used to unload the roof area of tear off shingles, debris, rocks, gravel & trash. When workers need to backfill high walls, a universal fit bucket is usually the preferred tool of choice. Universal Fit (slip-on-forks) Design permits use on both straight-mast and extendable reach type forklifts. Accepts up to 7” wide forks. Swivel Chute Included – 30” effective length, swings 40 degrees (20 degrees to each side), slope of chute adjustable with chain. Discharge Gate Can Be Controlled Manually. Handle can be positioned on either side. Heavy Duty Construction built with heavy gauge steel, all welded construction. Dump Bucket With Elephant Trunk Concrete Chute Forklift Attachment For Sale Call 281-342-0200 For A FREE Quote & Lead Time.